What types of discounts can I use? How to run a sale? How can I track Coupon codes? Note: all discount types currently accept only a percentage (%) off, it's not yet possible to set it to a specific amount of money. You can overview all your discounts at any time in the Discounts section. There, you'll find information about all discounts, number of products affected, usage stats and expiration date. There, you can edit each discount, change its name or remove it altogether. Note: Discount names are private (only you can see them) and can be used to categorize discounts by theme. Navigate to Marketing → Discounts in the left sidebar. Click the Add new discount button and select Coupon. Create a unique name for your discount. Choose what products should be affected by this discount. You can select one, multiple or all products. Add a coupon code that your buyers will have to enter at the checkout to get a discount. Alternatively, you may send them a link where the coupon code is already applied at the checkout. You can also set an expiration date for the discount. Finally, press Create to make the discount instantly available to your buyers. Note: Discount codes are NOT case sensitive, which means that the code "25OFF" will also work if written like this "25off". 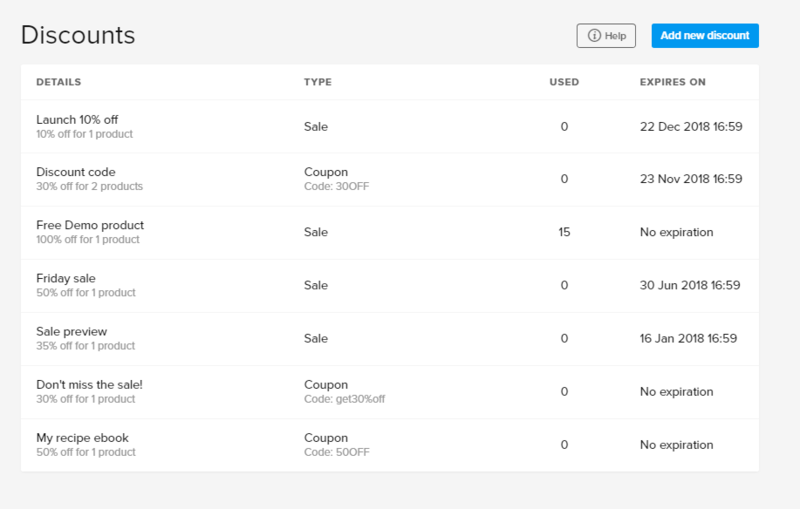 Your customers will see the coupon code field during checkout. Note: The coupon code field will only be visible at the checkout for items that have an active discount. To remove the coupon code field from the checkout, remove the discount for that item. 1.Navigate to Marketing → Discounts in the left sidebar. 2. Click the ''Add new discount'' button and select Sale. 3. Create a unique name for your discount (only you can see the name). 4. Choose what products should be affected by this discount. You can select one, multiple or all products, choose numerous products or only pick one product. 5. Select the discount amount in % and choose an expiration date. 6. Finally, press "Create" to make the discount instantly available to your buyers. Note: If you run a sale for a product that previously had Pay what you want pricing, the PWYW feature will be disabled for that product. You can run a sale or have the pay what you want pricing - but not both. For example, you might have a 10% sale on one of your products and a 25% off coupon code on all your products. If your customer enters the coupon code during checkout, he will receive 25% off the original price. Plus, priority is given to the newest discount (of the same type) applied. You can offer products for free on Sellfy by setting the price to $0.00 on the product editing page. This will automatically enable the Pay What You Want feature. You may also set the discounts as described above to 100%. Check out this article to read more about offering free products with our tools. If you charge for your product, the minimum price is $0.90. It also means that product price after discount will always be at least $0.90. This minimum is set to cover the fees associated with the transaction. Example: you have two products in your store, one priced $100 and other priced $1.23. If you enable a 50% sale for all items in your shop, the first product price will be $50 and the price of the second product will be $0.90. For the second product, initially priced $1.23, both the product page and checkout will display an adjusted discount (to set the minimum price $0.90), which in this case will be 26%. Note: When product price after discount is below the $0.90 minimum, we display adjusted discount on product page and checkout. Whenever a customer uses one of your coupon codes, the coupon name is reported in the Orders export. This feature can be used for a simplified affiliate program - you can create coupon codes for affiliates to offer to their audiences, and, in your Orders list, you'll be able to see how many sales were generated by that affiliate.